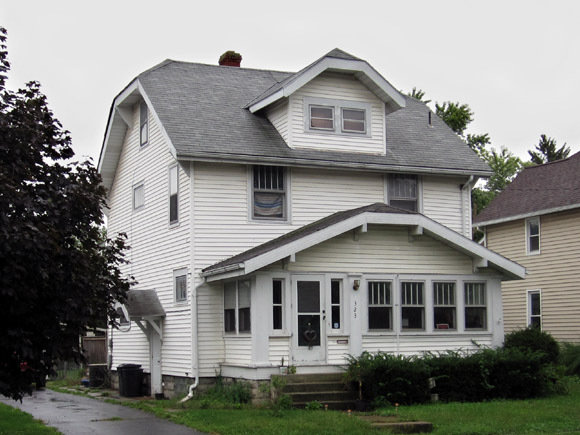 Please note: An expanded version of this story, including an interview with a neighborhood resident who believes Susan Bartee’s spirit may have taken up occasional residence at his house, is in our book Haunted Marion, Ohio. Willow Street is a quiet, tree-lined side-street just off of Presidential Drive. The houses are so nicely kept and unassuming that one would probably have a difficult time imagining any of them as the scene of a murder. But on a cold evening on February 28th, 1973, Rosemary Whittingham left her home on Mt. Vernon Avenue with a .22 caliber revolver and drove to 323 Willow Street to confront Susan Bartee and Susan’s husband Kenneth with evidence that Susan was continuing to have an affair with Rosemary’s husband, David Whittingham. Before the night was over, Mrs. Bartee would be dead and Mrs. Whittingham would be facing first-degree murder charges. According to the August 30th, 1973, edition of the Marion Star, David Whittingham came to Marion in 1970 to start a new job with Marion Power Shovel. His wife remained in Moline, Illinois to sell their house. Alone in Marion, David Whittingham began an affair with Susan Bartee. (How David and Susan met is unclear.) In any case, Rosemary Whittingham stated during her murder trial that she noticed a change in David when they did see each other. Her suspicions were confirmed on Mother’s Day 1971 when she confronted her husband and he admitted to the affair but claimed it was over. Rosemary was not convinced, however. According to the Star article, her doubts led her to “follow her husband, make note of Mrs. Bartee’s movements and phone calls, hire a local private detective and purchase a telephone tapping device.” She didn’t buy the gun until just a few weeks before the murder. Interestingly, if one believes the defense’s argument, Rosemary bought the gun with the intention of using it to take her own life rather than Susan Bartee’s. By early 1973 Rosemary Whittingham had ample evidence, mostly in recorded telephone calls, that the affair between her husband and Susan Bartee was far from over. On February 28th, Rosemary went to the Bartee home and, perhaps seeking an ally, attempted to play the taped conversations between David Whittingham and Susan Bartee for Kenneth Bartee. However, Susan, who was also present and none too happy to see Rosemary, insisted that the voice on the tape was a “forgery” and became so loud and disruptive when Rosemary tried to play the tapes for Kenneth that he was unable to hear the taped conversations. Clearly frustrated, Rosemary prepared to leave the Bartee home. Susan Bartee went to the dining room, leaving Kenneth and Rosemary in the kitchen together. Rosemary asked Kenneth, who was “sitting …with his head in his hands” for a drink of water before going into the other room where Susan was sitting. Rosemary later claimed in court that she couldn’t remember what she did next. However, the evidence was clear: Rosemary shot Susan in the head point-blank. Kenneth, horrified, rushed in a wrestled the gun out of Rosemary’s hands before calling the police. During the trial, Rosemary’s lawyer argued that she was temporarily insane during the episode and therefore not culpable for her own actions. However, the prosecution argued that Rosemary, who had a background in theater, was simply acting during her psychological examinations and during her testimony. On September 1st, 1973, after approximately three hours of deliberation, the jury found Rosemary Whittingham guilty of second degree murder. On September 14th, 1973, Marion County Common Pleas Judge Robert Kelly sentenced her to life in prison. The fate of both David Whittingham and Kenneth Bartee is unknown. My ex-husband and I purchased this house in the fall of 1984, unaware of its history. The day I picked up the keys from the seller, I asked, jokingly, about any weird noises the old house might make. He asked me if I was superstitious and told me about the affair that had ended with the woman waiting in the alley for the Bartees to come home. My friend said I turned a pale white. I was totally freaked out for the first couple of months. We had a really fun Halloween party that year, though. We lived there until the summer of 1990. Never heard or saw anything unusual. Mr. Bartee and his second wife, also Susan, lived there as well. The people we bought the house from had purchased the home from them. The house was originally built for one of the Baldaulf lumber families. I was the seller of the house in 1984. Sorry to have freaked you out. I don’t think we met in person before the closing. I just saw this post while googling for info on that old murder. We found out about the murder from the neighbors after we had moved in. Ironically, we bought the home from Ken and Sue Bartee and our names are Ken and Sue. We lived there from 1975 to 1984 and thoroughly enjoyed the home and the neighborhood. Sounds more like a case of downright murder than it does a ghost story. My husband and I lived there just recently for 2 years. We rented the house. I can be “sensitive” to the other world. I was, for lack of a better word, contacted quite often by at least one spirit that resides there. Most times it would be late at night, and I was not the only one in the house who was “contacted”. When we first moved in, I would get the feeling of someone wanting to push me down the stairs, or, if I was coming up from the basement, I got the feeling that someone wanted to slam the basement door on me. After awhile that slowly went away as if whatever it was had accepted me finally. There were more happenings while we lived there but nothing that I would call a real scary or horrorible act.